Currently Indian Commercial vehicle industry is in very exciting phase, post BS IV migration and GST implementation. While for many sectors, including Passenger cars, it will be more of price correction and short term gain, but for commercial vehicle industry it may be a game changer in long term. We may see consolidation in fright forwarders, emergence of new truck segments, correction in industry volume of existing segments etc. All this makes manufacturers to look beyond existing products and watch out for new segments. 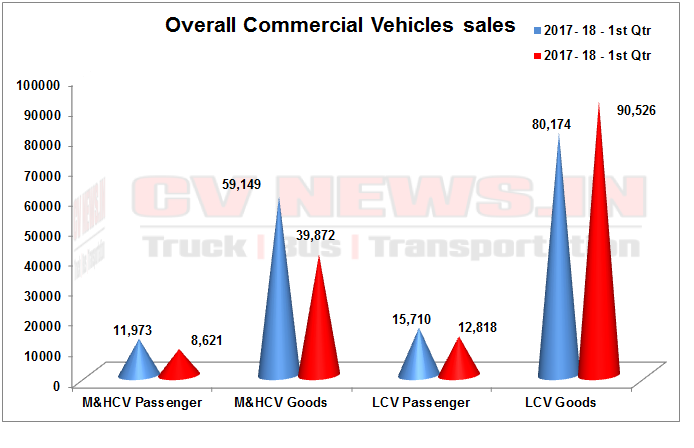 While we foresee some exciting days ahead, currently due to these regulatory implementation, there is steep drop in sales of commercial vehicles. Let us see what happened in this first Qtr of this year from April to June, 2017. 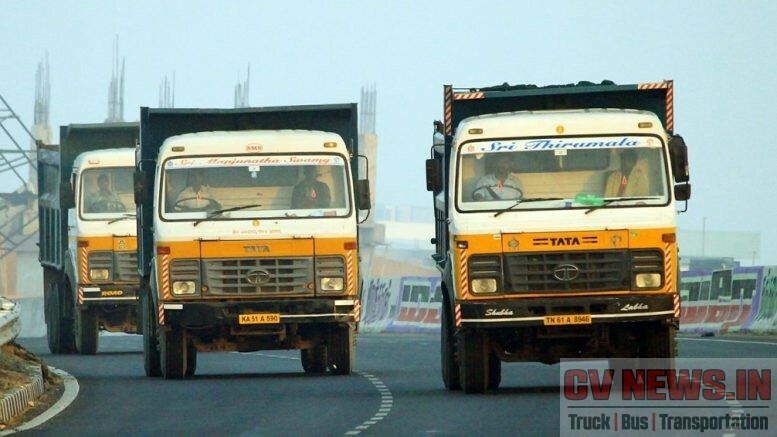 Overall volume of Heavy Commercial vehicles sales stood at 48,493 Nos with a dip of about 31.8% compared to last year. Volume of Light commercial vehicles passenger were down to 79,502 from 114, 417 with drop of about 31%. LCV trucks were up by 3.68% to 25,474 from 24,569 nos. 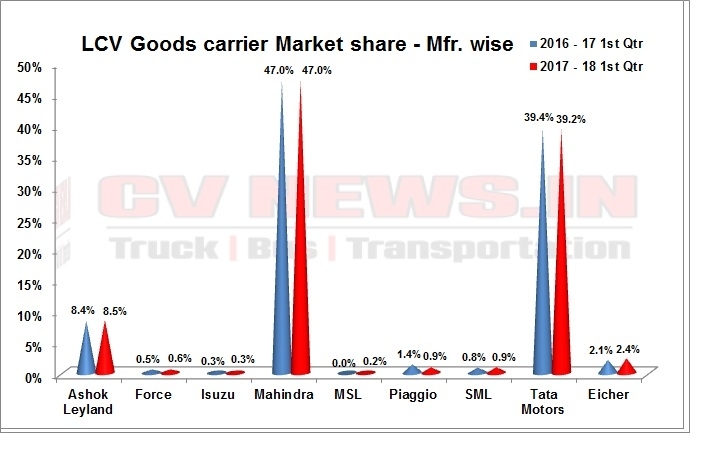 Due to BS IV migration and GST implementation there is a steep drop in sales and unlike Bharat Benz not many manufacturers have completely migrated their port folio to BS IV. Products continue to get rolled out in coming months, and we expect the sales to normalise in coming days. GST implementation will still act as damper for sales in coming days, but in total we may see a shift in segments. Ashok Leyland continues to out perform competition and grown to 34.6% MS. Ashok Leyland has achieved its highest market share for the month of June 2017. Sales stood at 16,817 nos, down 23.77% from 22,061 nos. Tata motors which is yet to recover fully from the BS III stock pileup issue has witnessed a sharp decline in market share to 46.4%. The sales has shrunk to 22,536 nos down 35.8% from 35,101 nos. Volvo Eicher too has witnessed a very sharp drop in sales upto 35.56% from 8,983 nos to 5,789 nos. Pro 5000 series is the new EGR based value trucks from Eciher and Eicher will continue to build momentum on it. Mahindra is the only manufacturer who has seen a single digit drop in sales of just 8% to 1,889 nos from 2,054 nos. SML Isuzu has sold 1,380 nos as against 2,696 nos during the same period last year with a drop of 48.81%. The Overall volumes has shrunk 32.59% from 59,149 nos to 39,872 nos. Tata motors continues to lead with sales of 19,864 though with a fall in sales of 37%, followed by Ashok Leyland with a sales of 13,683 nos with a fall in sales of 23%. Volvo Eicher sold 4,450 trucks with a fall in sales of 40.55% from 7,485 nos. Mahindra performed more of a muted performance, rather is the lowest affected manufacturer in drop in sales. Has sold 1,416 with a drop of just 5% from 1,490 nos. Tata still holds on to leadership position and maintains a market share of 49.8%, but its feeling the heat from competition. Tata held a market share of 53% for the corresponding period last year. Ashok Leyland has got early dividends from i-EGR and benefits are showing in sales and market share. AL continues to progress in market share and is currently at 34.3% for the first quarter up from 30% last year. 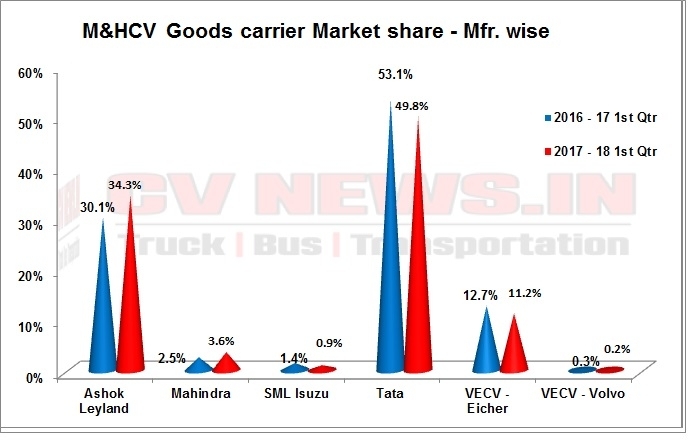 While Volvo Eicher has managed to loose market share to 11.2% from 12.7%, Mahindra increased market share to 3.6%. Intermediate Commercial Vehicle segment has witnessed a drop of 27% to 7,612 nos from 10,451 nos last year. Eicher continues to lead market with 40% market share and sold 3,043 trucks. Tata motors managed to loose a market share of about 2% to 30% and sold 2,285 nos. SML Isuzu has sold 377 trucks only in 7.5T to 10T category. 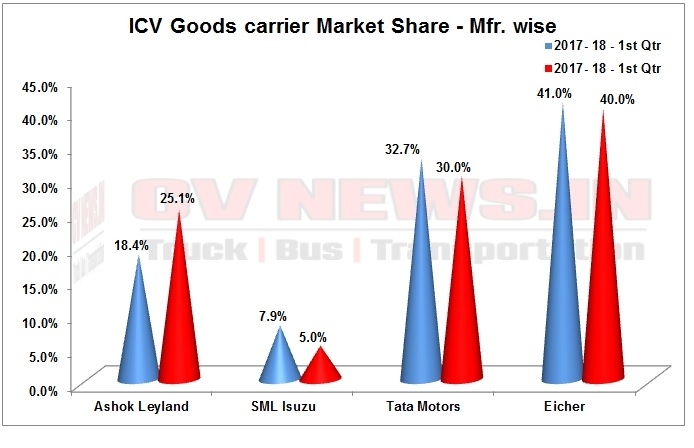 Though the overall ICV market share of SML Isuzu is at 5%, it continues to do well in 7.5T to 10T segment. Ashok Leyland has gained sharply in market share to about 25% from 18% for the corresponding period. Sales stood at 1,907 nos. 6 years back, Ashok Leyland had a market share of just over 6% for the 1st qtr of 2011-12. In 6 years Ashok Leyland had worked on newer products like Boss, Guru and launched newer variants in Ecomet and has reached a significant position today. Overall segment has seen a growth of 8% to 3,60,839 nos from 3,34,371 nos. Mahindra continue to lead the segment with Bolero based pick ups and managed to sell 1,69,594 units up by 8%. Interestingly every manufacturer maintained their market share and Mahindra maintains at 47%. Tata motors with 40% market share has sold 1,41,470 nos up by 7% from 1,31,899 nos. 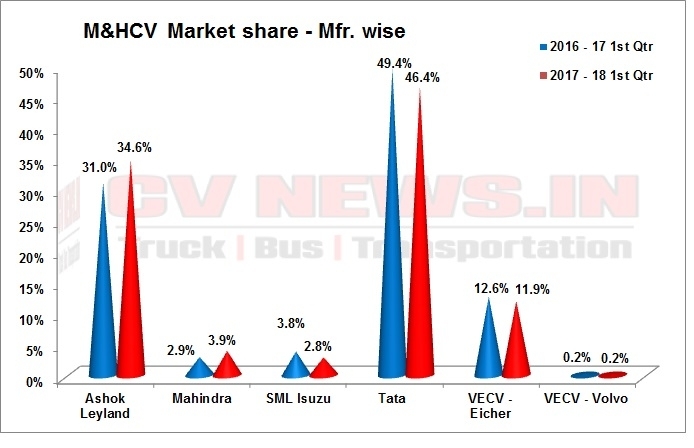 Tata leads in Ace based SCV’s and sub 1.5T segment where it still doesn’t have a serious competitor. While Mahindra and Tata occupies more than 85% in market, Ashok Leyland sold 30,968 nos with majority sales from Dost. With new variants of Dost with higher tonnage coming in few weeks, we may see better sales numbers in future. Ashok Leyland maintains its market share at 8.5%. Eicher with Pro 1049 has done a fairly better job at 8,525 nos up by 22% from 6,975 nos and has a market share of 2.4%. Maruti is a new entrant with its Super Carry, a 750kg payload mini truck and sold 900 units. Maruti has opened dealerships across nation and may gain momentum in coming days. Disclaimer : All information contained herein has been obtained by CV News.in, from sources believed by it to be accurate and reliable. Although reasonable care has been taken to ensure that the information herein is true, CV News in particular, makes no representation or warranty, express or implied, as to the accuracy, timeliness or completeness of any such information. All information contained herein must be construed solely as statements of opinion, and CV News.in shall not be liable for any losses incurred by users from any use of this publication or its contents. Volvo buses, Scania Commercial Vehicles, Daimler India Commercial vehicle sales aren’t included while preparing reports. 1 Comment on "Truck Sales and Market share Review – 1st Qtr, 2017 – 18." But interestingly, when CV pundits thought there would be lot of bre-buying before 31st March and first quarter of BS4 would see steep decline in demand. Both the prediction were incorrect, BS4 pre-buying was very marginal and OEMs were left with huge inventory, after BS4, demand hasn’t gone down as expected, but OEMs are facing uphill task to meet this not-so-heavy demand..! !